German electro metal band, Cold Rush are due to release their second album ‘AmoKKoma’ later this year. Their first album, ‘The Illness’ was released in 2009 and since then the band has undergone a change in line up including recruiting a new front man Matthias Kupka. With this new album, the band promise that their sound will be harder, more melodic and catchy . 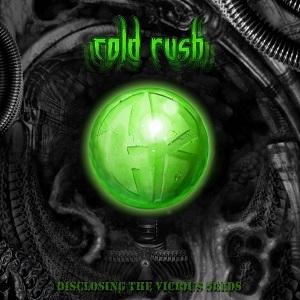 To give fans an idea of what to expect, Cold Rush are releasing a two track CD single - Disclosing the vicious seeds. "Daily crime" begins with a speech being played back over some synthesiser before the vocals kick in. The music is melodic electronic music - heavy on the synth/keyboards, but this is balanced with some very heavy metal vocals. These vocals contrast strongly against the more melodic music, and somehow it works extremely well - I hadnt expected it to be quite so successful a combination. Again, "White Z" starts with a recorded bit of speech before the music and vocals kick in. It's a similar style to "Daily crime", and like that track, its very good. Having listened to the single, I'm definitely looking forward to hearing the album when its ready for release.